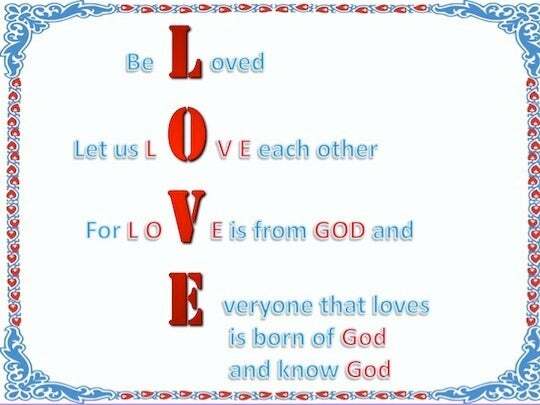 ﻿ 1 John 4:7 Beloved, let us love one another, for love is from God; and everyone who loves is born of God and knows God. Dear friends, let us continuously love one another, because love comes from God. Everyone who loves has been born from God and knows God. Beloved, we should love each other. Because love is of God, and every man who loves has been begotten of God, and knows God. Beloved, let us love one another, for love is (springs) from God; and he who loves [his fellowmen] is begotten (born) of God and is coming [progressively] to know and understand God [to perceive and recognize and get a better and clearer knowledge of Him]. Loved ones, we should have love for one another, because love comes from [the very nature of] God, and every person who [continually] loves [others] has been [spiritually] conceived by God [See 2:29; 3:9], and knows [he is in fellowship with] God. 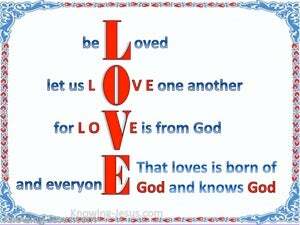 Beloved, let us love one another; for love is of God: and every one that loves, has been begotten of God, and knows God. 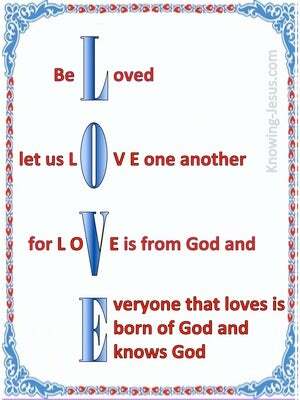 Beloved, let us love one another: for love is of God; and every one that loveth, is born of God, and knoweth God. Beloved, let us love one another; for love is from God: and every one who loves, has been begotten by God, and knows God. Beloved, let us love one another with divine love: because divine love is of God; and the one loving with divine love has been born of God, and knows God. 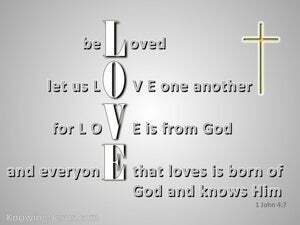 Dear friends, let us love one another, for love comes from God, and everyone who loves is a child of God and knows God. 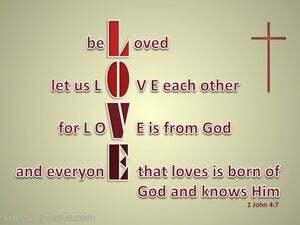 Beloved, let us love one another; for love is of God, and every one that loveth is born of God, and knoweth God. Beloved, let us love one another, for charity is of God. 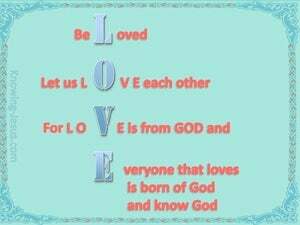 Anyone that loves is born of God and knows God. 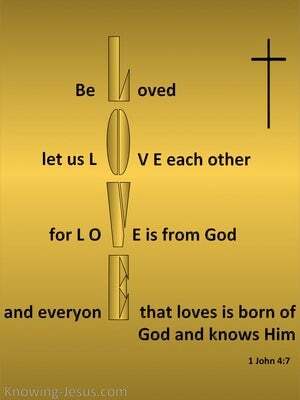 Dearly beloved, we should love one another: for love is of God; and every one loving has been born of God, and knows God. Dear friends, let us love one another, because love is from God, and everyone who loves has been fathered by God and knows God. 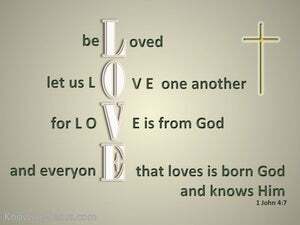 Beloved, let us love one another, for love is of God, and everyone who loves has been born of God, and knows God. Dearly beloved, let us love one another: for love is of God. And all that love are born of God, and knoweth God. Beloved, let us love one another; for love is of God; and every one that loves us a child of God. Beloved, let us love one another, for love is of God, and every one that loves has been born of God and knows God. 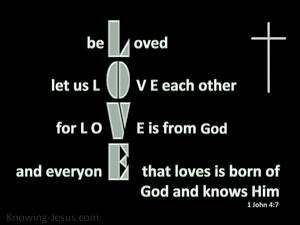 Beloved, let us love one another; because love is from God, and every one who loveth is born of God, and knoweth God. Dear friends, let us love one another, because Love comes from God; and every one who loves has received the new Life from God and knows God. Dearly beloved, let us practice loving one another, because love originates with God, and everyone who practices loving is a child of God and knows God by experience. 6 We are from God; he who knows God listens to us; he who is not from God does not listen to us By this we know the spirit of truth and the spirit of error. 7 Beloved, let us love one another, for love is from God; and everyone who loves is born of God and knows God. 8 The one who does not love does not know God, for God is love.